As the sun begins to set and the stars form a blanket over Saint Mary’s College, a silver dome comes into focus on the hill near the cross. The Geissberger Observatory stands as an image of what the College holds dear – the relationship between religion and science. 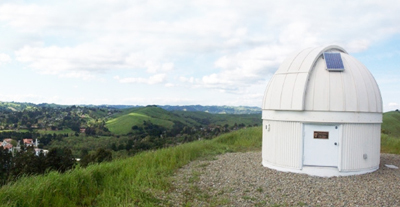 The observatory was completed in 2004, allowing students to add a hands-on approach to their study of sciences like astronomy and physics. The observatory stands 277 meters above sea level and permits students to conduct advanced scientific research. The silver dome embodies the education that is valued on Saint Mary’s campus and signifies that science is a respected subject practiced here. “We do science here, and we do it well,” says SMC Astrophysics Professor Ronald Olowin. But the department hasn't always had the tools it needed to make this claim. Prior to the late 1990s, the Astronomy and Physics departments were merged as one within the Mathematics department, and they did not have many instruments to call their own. With a plan in mind, Olowin set out with determination to make significant changes. Although it took many years and proposals for Saint Mary’s to consider building an observatory, there were early signs that the project was moving in the right direction. Beginning with the building of the observing pad and meteorology tower, the School of Science started to launch something much bigger than anyone had hoped. Yet, the Astronomy and Physics departments still needed a research instrument. Dr. Louis Geissberger, a member of the Board of Regents and a Gael graduate from the class of 1953, came to the rescue. “I have often said that I am very fortunate in life, and I owe everything to Saint Mary’s College,” he said at the time. With the help of a $250,000 donation from the Geissberger family, construction began in the summer of 2003. In 2004, upon completion of the observatory, Geissberger dedicated it to his late wife, Norma. The silver dome stands atop “Observatory Hill” and is home to a 16-inch telescope. This instrument is used as a research-grade telescope, which is comparable to the telescope used at Harvard University. It is in this observatory that a graduate of Saint Mary’s from the class of 2007, Tom Scarry, discovered a near-earth asteroid. Unfortunately, before he had enough observations to publish his findings, the famous Bay Area fog shrouded the sky, leaving him without any documentation. Through the lens of the telescope, stars, galaxies, and supernovas become visible - and maybe even heaven is not too distant. Olowin suggests that the observatory is “iconic of science” but he doesn’t fail to mention the white cross next to it. These two prominent structures represent the confluence of what he calls “faith and reason.” Saint Mary’s has strong educational values that create a bond between these two ideas. Next time you wander the campus grounds, take a moment to notice the sun beginning to set and observe the beauty of Saint Mary’s and its own silver-domed observatory.